It’s rare that a WoW NPC is named absolutely perfectly for its role. 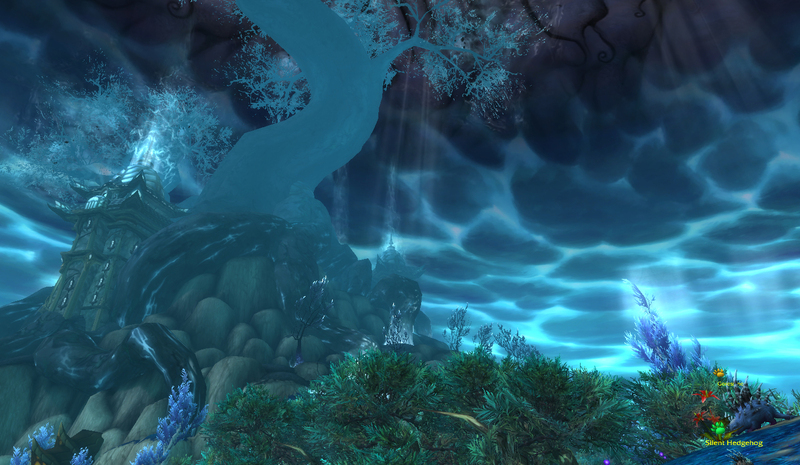 My personal favorite is Malfurion Stormrage, whose name literally means Badangry Angryangry. 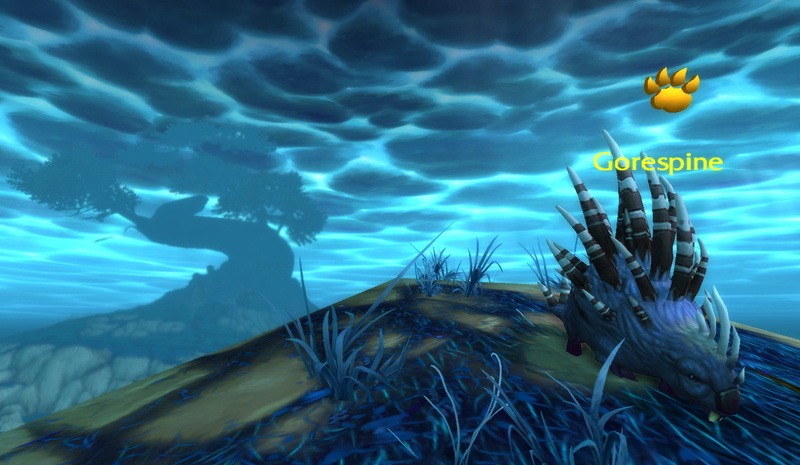 But Gorespine comes pretty close. Gorespine is a Beast of Fable in Book 3, along with Ti’un and No-No. He’s located on the extreme West of the Dread Wastes, on a cliff overlooking the Briny Muck. 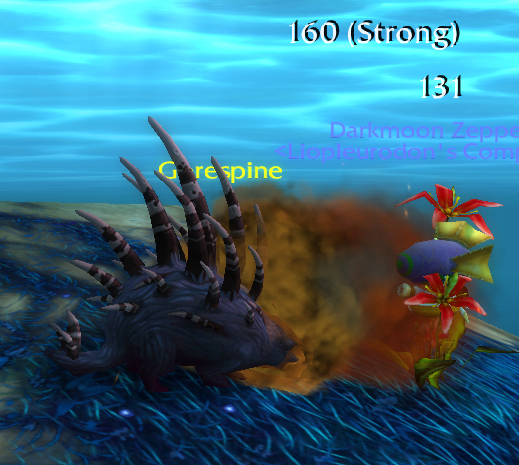 Gorespine has 2 relatively straightforward attack abilities, plus the slightly complicated Spined Skin. It adds a per-hit shield component and a reflexive damage component if you can manage to punch through the shield. Gorespine’s regular damage does either 600 a hit, or 400 a hit with a DoT. So, he has spines, and he’s going to gore you. Get it? 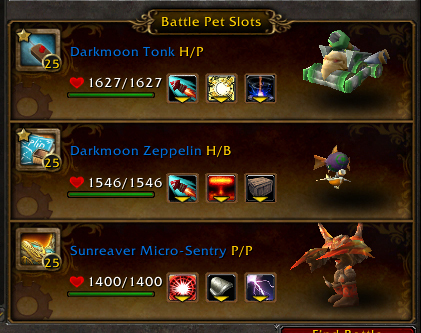 The first 2 battle pets selected, the Darkmoon Tonk and Darkmoon Zeppelin, have a straightforward single-hit damage dealer, plus a huge hitting single nuke blaze of glory move. The anchor battle pet, the Sunreaver Micro-Sentry, has a few relatively straightforward moves, but more importantly the Extra Plating move, which gives that last pet far more longevity to hopefully finish off Gorespine. The strategy is a bit similar to what we used for Kafi. Basically, we single-target nuke Gorespine until we’re fairly sure our pet will die next turn, and then we use our last Pyrrhic move. Explode on the Zeppelin means your pet just up & dies after delivering a massive hit. Ion Cannon on the Tonk means that after its hit, it has to recover for several rounds before you can perform any other actions (including swapping pets). Both mean you need to use them when you’re done with that pet. Saving the Sunreaver Micro-Sentry for last means that we can use Extra Plating to get in extra damage on Gorespine if necessary, but I’ve rarely had to use my anchor pet at all, unless I duff one of the 2 take no prisoners moves. Every hit all your battle pets deal will receive a ~130 reflexive damage in return, so just using a whole bunch of pets with Extra Plating generally doesn’t have the firepower to win the match. In place of the first 2 battle pets, the Tranquil Mechanical Yeti or Menagerie Custodian are good choices, as are the Pet Bombling and Blackfuse Bombling, because they all have those big match-ending moves. Just keep in mind that you need to select non-DoT, single-hitting damage moves in your other slots. A pet with Launch Rocket, like the Clockwork Gnome, might be an alright backup choice. Launch Rocket’s 2-turn nature makes it a bit less easy to use, but may lend to more dps throughput depending on how many turns your pet can survive. The Mechanical Pandaren Dragonling is further down the list for me here, because while it does have the Explode button, it has no other meaningful offense to use here. To be completely honest, in place of the Micro-Sentry I actually prefer Son of Animus, but he’s still super rare and the Micro-Sentry gets the job done really well anyway. Nearly any pet with Extra Plating is an OK choice here. Howl Bomb strategy works really well here, too. This entry was posted in Beasts of Fable and tagged beasts of fable, daily on May 16, 2014 by Liopleurodon.